The team of Eric Hochberg, Yvonne Sawall, and Nick Bates (left to right) was selected in October to receive BIOS’s 2017 Cawthorn Innovation Award for a research proposal on coral reef ecosystems. Coral reefs present scientists with a unique challenge. How do you accurately measure ecosystem processes—such as photosynthesis and calcification—within a system that changes over the course of a day and between days (depending on water flow, tides, sunlight, and weather, among other factors) and that also contains a variety of reef types and habitats (such as rim reefs, in-shore reefs, and deep water reefs)? As with many terrestrial ecosystems, like forests, one measure of the health of coral reefs is primary productivity, or the rate at which photosynthesis is occurring. However, unlike terrestrial ecosystems, another metric—calcification, or the rate at which new reef growth occurs—is also a vital component of reef health and function. Accurately measuring and describing these two processes would allow scientists to better understand how reef ecosystems function and respond to changing environmental conditions, such as a warming ocean. However, studies are often restricted to short windows of time, sampled over one small area of reef habitat, or lack additional data that provide links to environmental conditions. 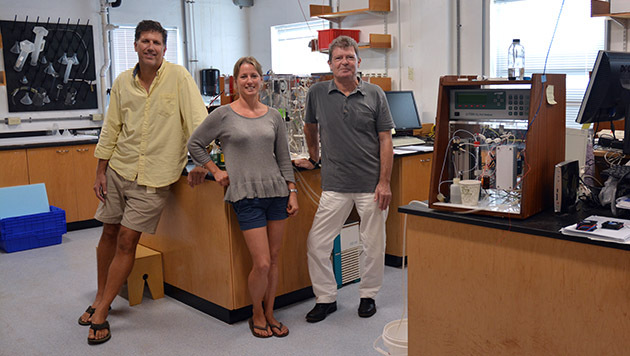 A team of BIOS researchers aims to improve the ability to measure these processes, while integrating these measurements into long-standing Bermuda time-series programs, with funds from the 2017 Cawthorn Innovation Award. The award, established in 2016 by trustee emeritus Rob Cawthorn to support innovative and challenging research ideas, went to the team of Eric Hochberg, Yvonne Sawall, and Nick Bates for their proposal titled “Improving reef calcification measurements and exploring dynamics of reef functioning.” This proposal was one of seven submitted in this year’s competition, which totaled more than $500,000 in grant requests. “Bermuda is an excellent location for this study because it has a very dynamic environment with strong seasonal fluctuations in light and temperature, as well as a wide range of shallow water habitats,” Hochberg said of the proposal topic. At the heart of their proposal is the acquisition of new instrumentation—two automated water samplers—that will enhance the types and scales of measurements that can be made in the reef environment. These samplers will be integrated into existing instrument packages, called gradient flux setups, that are anchored to the reef floor. The gradient flux setups collect data on water flow and dissolved oxygen, which provide measurements of primary productivity of the surrounding area. With the addition of automated water samplers, the team will be able to measure additional water quality parameters used to calculate calcification. And, unlike traditional water sampling methods, these automated samplers can be left in the field for up to a year, increasing the length of sampling time from hours and days to weeks and months. "This approach gives researchers insight into how reef metabolic processes, such as photosynthesis and calcification, change on an hourly basis, which is crucial in understanding the function of an ecosystem in which environmental factors change on smaller timescales," said Sawall. Data from the samplers will also be integrated with carbon data from the Bermuda Atlantic Time-series Study (BATS), a decades-long time-series program that collects information about ocean conditions in the Sargasso Sea. The additional information provided by BATS and the Cawthorn Award will provide new insight into how changing environmental conditions, such as water chemistry, impact reef ecosystem metabolism and health. “The support from the Cawthorn Award is an important contribution to the grand challenges facing oceanographers and marine biologists and in particular, understanding the future and fate of coral reefs under the threat of environmental and climate changes,” Bates said. Work began in earnest on the yearlong project after the funding announcement was made in mid-October. Currently, Sawall and Hochberg are in the process of testing components of the automated samplers to ensure the equipment can withstand the rigors of long-term field deployment over the winter months. Once fieldwork and data analysis are complete, the team intends to use the results to seek further funding from the National Science Foundation for larger-scale studies that include other geographic regions. The data will also be available for use in a variety of complementary studies and research collaborations within BIOS on topics such as nutrient cycling, carbon budgets in coral reefs, and seasonal dynamics of how corals obtain nutrients.